Island Princess is one of the two 92,000-ton Coral-class ships -- the other is Coral Princess -- that offer transits through the Panama Canal. They were custom built to do so and are the only two Princess ships in the fleet small enough to get through the locks. A 2015 dry dock added 121 staterooms and reorganized and refurbished certain public areas of the ship to accommodate the new cabins. The Horizon Court was remodeled to improve passenger flow, and its updated design includes the addition of an Italian pastry shop. If you sailed the ship previously, you will feel like a first timer as many public spaces have changed locations: The Sanctuary sun deck is now on one deck instead of two and its pool is gone; the teen center has moved to Deck 14, while the kids club has lost its outdoor space; the fitness center exchanged its former Deck 14 location to one on Deck 6; and even the shore excursions desk and future cruise booking office have new locations. The multipurpose Universe Lounge is no more. The end result is that the remaining public areas can feel more crowded with the addition of the extra passengers. Despite the refit, the ship still feels a little dated, especially in the corridors (which can be uneven in places) and cabin bathrooms. While the four-story atrium -- undoubtedly eye-catching with its lovely, tinkling waterfall, glass-fronted elevator, comfortable seating, white grand piano and profusion of greenery -- is the centerpiece of the ship, the area still has a cramped feeling, which is particularly noticeable on sea days. Island Princess is a comfortable ship. It won't intimidate virgin cruisers like some of the newest behemoths might do, and staff throughout the ship are pleasant and willing to help with queries or requests. With plenty of onboard entertainment opportunities, a good selection of shore excursions, good food and fantastic kids' programs, the ship makes it easy for guests to have an enjoyable holiday. Island Princess attracts families, couples and a few singles. Although it is a ship for all ages, summer holidays tend to attract more families with children and teenagers. Our Mediterranean cruise attracted a good mix of ages, with the bulk of passengers hailing from the United States, followed by Brits and a healthy smattering of Australians. Other nationalities -- including Chinese, Japanese, Canadians and Italians -- made up the balance. 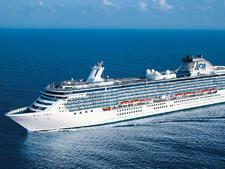 Depending on itinerary, however, it would be fair to say that the majority of Island Princess passengers are American. Announcements are kept to a minimum. Cruise Critic’s professional photographers and our extraordinary community members have taken 1,697 pictures of Island Princess. When you visit our photo galleries, you can be assured that what you see is what you get. During the day, anything goes, although beachwear is not allowed in the restaurants without a cover-up. On most nights, recommended evening dress is smart casual -- an open-neck shirt and trousers for men and a dress, skirt ensemble or trouser suit for women. Cruises of five nights or longer include at least one formal dining night, while cruises of seven to 13 nights have two formal evenings. Although Princess asks that passengers observe the dress code, particularly in the main dining rooms, we saw many people flouting the rules. Men, in particular, turned up in short sleeve, open-neck checked shirts, casual trousers and sneakers. Generally speaking, ladies were better turned-out; while less than a handful wore evening gowns, most turned up in cocktail dresses or elegant trouser suits. Staff seemed to turn a blind eye to any dress code infractions. A daily gratuity of $12.95 is automatically added to every passenger's onboard accounts, including children; $13.95 is added for those in mini-suites and suites. A 15 percent tip is added to bar purchases, dining room wine accounts and spa bills. Currency onboard is the U.S. dollar.